© Posted on January 8, 2018, by Michael E. Newton. 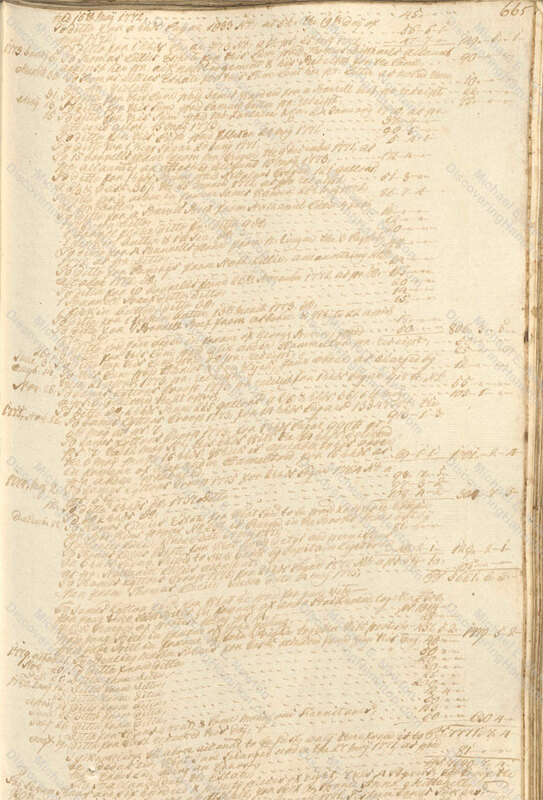 In a 1939 essay, H. U. Ramsing shared his discovery of numerous entries in the probate record of a Thomas Lillie of St. Croix relating to the estate of James Lytton, Alexander Hamilton’s uncle. Among the hundreds of entries are dozens pertaining to Ann Lytton Venton, the daughter of James Lytton and Alexander Hamilton’s first cousin. Among these entries for Ann Lytton Venton are four quittances [receipts] “with” Alexander Hamilton for 120 rigsdalers, 1 hogshead of sugar, and 1 hogshead of rum. There is also one “order in favor of Alexander Hamilton” for 15 hogsheads of sugar. These entries are dated May 16 and 23, 1772, May 3 and 26, 1773, and June 3, 1773. While H. U. Ramsing found these entries in Thomas Lillie’s probate record, which was compiled in 1780, they actually appeared in another volume back in 1776. As can be seen from the above images and the corresponding entries in The Papers of Alexander Hamilton, the records of these four quittances and one order are mere summaries and are missing information vital to understanding the transactions. These two transactions match exactly Ann Lytton Venton’s quittance with Hamilton of the same date. Clearly, Nicholas Cruger had acted as Hamilton’s banker in this transaction. A week later, on May 23, 1772, Ann Lytton Venton debited her father’s estate one hogshead containing 118 gallons of rum “delivered [to] A. Hammilton, on your account per receipt,” with a value of 55rdl 1r 2st. This transaction also matches Ann Lytton Venton’s quittance with Hamilton of the same date. The following year, on May 26, 1773, Ann Lytton Venton debited her father’s estate 50 rigsdalers for the “sum paid Alexander Hammelton pr. receipt.” A week later, on June 3, Ann Lytton Venton paid Hamilton another 25 rigsdalers. These transactions again match two of Ann Lytton Venton’s quittances as found in Thomas Lillie’s probate record. Two more transactions appear on November 26, 1773. 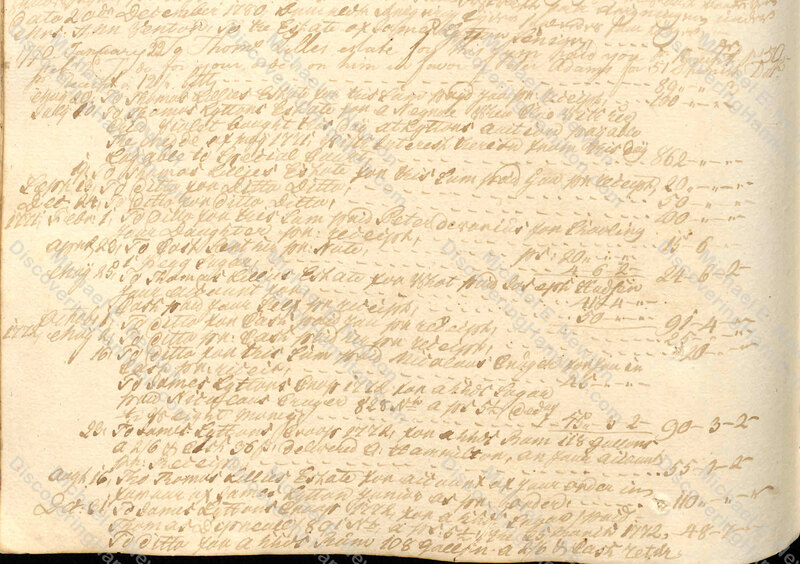 The first transaction, which is backdated to May 6, 1773, is for “14 hogsheads sugar,” holding 13,347 pounds of sugar, and valued at 913rdl 1r 3st. This is followed by another transaction, backdated to May 12, 1773, for “1 hogshead sugar” with 990 more pounds of sugar valued at 69rdl 1r 1st, with an additional note that “this hogshead with the 14 hogsheads delivered the 6th May make the 15 hogsheads which is agreeable to his order in favor of Alexander Hamelton for 15 hogsheads.” The value of these 15 hogsheads of sugar totaled 1001rdl 2r 4st. These 15 hogsheads of sugar are clearly the same as those mentioned in Ann Lytton Venton’s order in favor of Alexander Hamilton dated May 3, 1773. Other records show that Captain William Lightbourn was outbound from Christiansted sailing for New York on May 25–26, 1773, suggesting that the above six hogsheads of sugar may have been part of the fifteen hogsheads sent to Hamilton at this time. If Ann Lytton Venton did indeed pay the shipping costs on these six hogsheads of sugar, it is likely she paid the costs of the other nine as well and possibly paid for other expenses Hamilton may have incurred during his move from St. Croix to the North American mainland. If so, these additional payments by Ann Lytton Venton were not recorded or the records of those transactions have not yet been found or no longer exist. Many have argued that Alexander Hamilton, in receiving the above money, sugar, and rum, had acted as Ann Lytton Venton’s “middleman,” presumably to prevent her husband, from whom she had separated, from collecting her share of the proceeds from the estate of her father James Lytton. The records, however, as displayed above, clearly show that Ann Lytton Venton regularly debited her father’s estate without the need of a “middleman.” Thus, it is clear that the above transactions involving Alexander Hamilton were gifts to him. As Hamilton by the time of these transactions had a good job working as head clerk for Nicholas Cruger and had lived for many years without apparent financial support from his cousin, he presumably did not need these funds from Ann Lytton Venton for his everyday living. Based on later events, it is clear that these gifts were to help Alexander Hamilton pay for his education on the mainland. Accordingly, the funds given to Hamilton by his cousin in May 1772 are the first indications that Hamilton was planning and even preparing to go to the mainland for school, further dispelling the notion that Hamilton had only been sent to North America for an education as a direct result of the impression left by his account of the great hurricane, which was not written until five months later and not published until after he had already left the island. Based on the figures provided in these newly discovered records, it is clear that Ann Lytton Venton was Alexander Hamilton’s primary if not sole benefactor. Her gifts of May 1772 consisted of forty-five rigsdalers, a hogshead of sugar, and a hogshead of rum, valued at precisely 145rdl 4r 4st according to the records of the Lytton estate, or approximately £23 sterling. Ann Lytton Venton’s gifts of May and June of 1773 provided Hamilton with another fifteen hogsheads of sugar and seventy-five rigsdalers, worth precisely 1,076rdl 2r 4st, or about £172 sterling. This brought the total value of Ann Lytton Venton’s gifts to Alexander Hamilton to exactly 1,221rdl 7r 2st, or about £196 sterling, at a time when the average British worker earned just £16 per year. Ann Lytton Venton’s gifts to Alexander Hamilton were expected to cover all or most of Hamilton’s educational expenses. 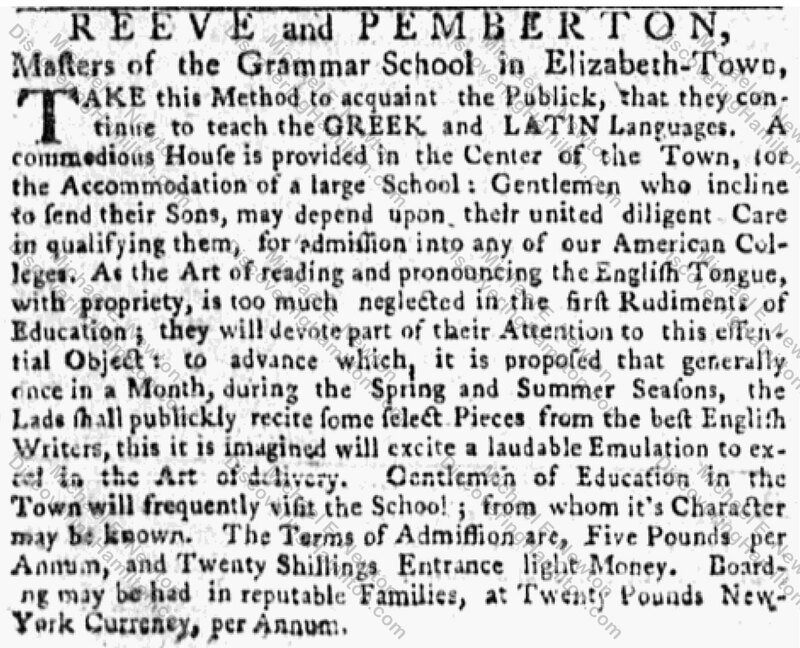 According to a 1767 advertisement, the grammar school in Elizabethtown, New Jersey, which Hamilton would attend, charged twenty shillings for admission, five pounds per year for tuition, and twenty pounds per year for boarding with a local “reputable” family. 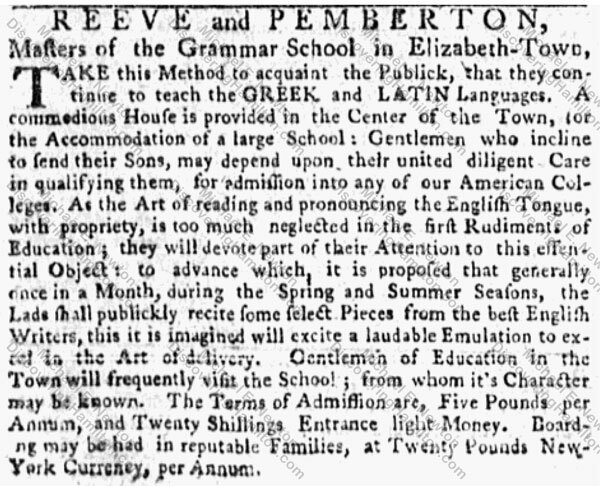 The cost of a year at this grammar school totaled twenty-six pounds New York money, or about £15 sterling. Hamilton, of course, would have additional expenses, such as travel and clothing. Thus, Ann Lytton Venton’s gifts of May 1772 of about £23 sterling was more than enough to get Alexander Hamilton started and was perhaps enough to cover the first year at the grammar school he attended. Thus, the £172 sterling Ann Lytton Venton had given Hamilton in 1773 probably was sufficient to cover any remaining expenses from his year in grammar school plus the cost of four years in college, and she surely offered to provide him with additional funds if these were insufficient. Although others may have contributed to Hamilton’s education fund, it is clear from these records that Ann Lytton Venton was Alexander Hamilton’s primary if not sole benefactor. In the end, Alexander Hamilton spent just two and a half years at King’s College before “the American Revolution supervened.” He used what remained in his education fund, provided to him entirely or mostly by Ann Lytton Venton, to equip the artillery company he raised in early 1776. Ever thankful for his cousin’s generosity, Alexander Hamilton wrote in his final letter to his wife that Ann Lytton Venton (by this time known as Ann Mitchell) was “the person in the world to whom as a friend I am under the greatest obligations.” As the person who paid for Alexander Hamilton’s education on mainland North America, thereby launching his American career, the little-known Ann Lytton Venton Mitchell deserves our gratitude, just as she had earned the gratitude of her cousin Alexander Hamilton. PAH 1:32, 33, 40, and 41. The numbers given in the records don’t add up. Adding 913rdl 1r 3st and 69rdl 1r 1st totals 982rdl 2r 4st, not 1,001rdl 2r 4st. The 69rdl 1r 1st is probably correct because 990 pounds of sugar at the listed 7 rigsdalers per hundredweight totals 69rdl 2r 2st, nearly the same as the amount recorded. However, 13,347 pounds of sugar at 7 rigsdalers per hundredweight would total 934rdl 2r 2st, well above the 913rdl 1r 3st recorded. The 14,337 pounds of sugar at 7 rigsdalers per hundredweight should total 1,003rdl 4r 4st, close to the 1,001rdl 2r 4st given. H. U. Ramsing, “Alexander Hamilton og hans Mødrene Slaegt”; Chernow, Alexander Hamilton 39. Newton, Alexander Hamilton: The Formative Years 57–58 and 59–60. A History of Columbia University 27 and 40. Humphrey, From King’s College to Columbia 252. Humphrey, From King’s College to Columbia 93–94. Humphrey, From King’s College to Columbia 91–92. Alexander Hamilton to William Hamilton, May 2, 1797, in PAH 21:77. 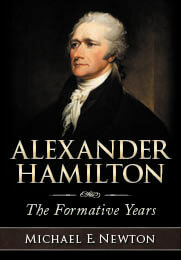 John C. Hamilton, The Life of Alexander Hamilton 1:52; John C. Hamilton, History of the Republic 1:121. Alexander Hamilton to Elizabeth Hamilton, July 10, 1804, in PAH 26:307. Excellent information! Thank you for this post. Fantastic revelation. I’m wondering if she had political connections on the mainland, or through Rev. Knox, which would have facilitated Hamilton’s integration into revolutionary networks in New York and New Jersey. Ann Lytton Venton had lived on the mainland for a few years before returning to St. Croix. There is no indication that she had any influential connections. But Hamilton had plenty of connections through Nicholas Cruger, David Beekman, and Cornelius Kortright, scions of three of NY’s most influential families. Hugh Knox, of course, had connections too to the academic world, especially the College of New Jersey and therefore also the grammar school in Elizabethtown. Behind every good man is a good woman. Hamilton had at least three good women behind him: his mother, his cousin, and his wife.